We are all aware of how great eating fresh, whole foods are in enabling a healthy diet with high energy levels. Eating plenty of fruit and vegetables, as a part of a healthy diet, can greatly improve energy levels, mental focus and clarity, as well as protecting from disease and enhancing the quality of life. 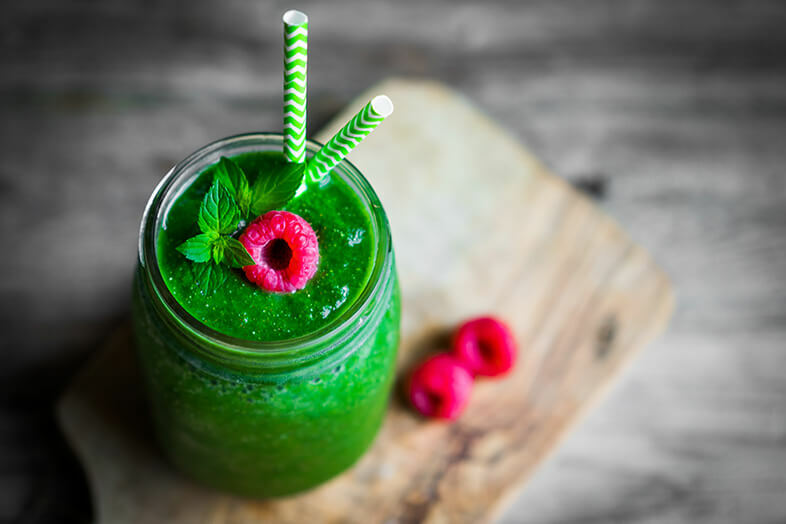 One great way of making this easy is to commit to having this life-changing smoothie regularly and give yourself a vibrant boost of energy in the morning. Why is this a great smoothie? If you use soy milk, it is low in saturated fat and cholesterol. It is also a great source of many vitamins and minerals: Vitamin E, iron, magnesium, phosphorus, copper and selenium, Vitamin A, Vitamin B12 and manganese. Research has also demonstrated that soy can prevent breast cancer, fight heart disease, osteoporosis, diabetes and kidney disease. Almond milk provides calcium and Vitamins, D, A and E. It has no saturated fat, it also has high potassium. Although, it is important to note that it has high sugar content. Bananas are very low in saturated fat, cholesterol and sodium. It is also good for dietary fiber, Vitamin C, Vitamin B6, potassium and manganese. They are great for all-around health benefits. The combination of carbohydrates and B vitamins help to provide an energy boost – therefore, a great start to the day. Spinach is also low in saturated fat and cholesterol, whilst providing niacin, zinc, fiber, protein, Vitamin A, C, E, B6 and K, thiamin, riboflavin, folate, calcium, iron, magnesium, phosphorus, potassium, copper, etc. Basically, there is everything in this, so it is a great whole-round food. It is also a fantastic food if you are looking at building muscles and achieving optimum health. Swiss chard is low in saturated fat and cholesterol, also a great source of numerous vitamins and minerals. The same can also be said for kale, which means they can be easily interchanged without any problems. Both swiss chard and kale contain many of the essential amino acids needed for coding human DNA. Mango is a good source of dietary fiber as well as Vitamins B6, A and C. Many of the vitamins (particularly A) are higher than other fruits. Eating mangoes in season may provide enough Vitamin A which can be stored in the liver, which is sufficient for the rest of the year. All vitamins are essential for good health, playing a role in the healthy functioning of various organs and tissues in the body, even the formation of red blood cells. Many of the B vitamins are the energy-fuelling vitamins (hence the high numbers found in energy drinks) which are found naturally in the above-mentioned ingredients. Other vitamins can help to optimise other functions in the body. Magnesium promotes better sleep and muscle recovery, therefore, this will help to produce an overall increased feeling of being energised. Iron is essential in helping oxygen circulate throughout the body, every cell needs it to function and develop properly. Having a good amount of iron enables you to increase your energy for cognitive and physical abilities, as well as keeping up high immunity. Vitamins and minerals are essential to help you stay alert and energised throughout the day. By incorporating these into a balanced diet, starting your day with whole foods (rather than supplements) will help you maintain a healthy and energised lifestyle.